BRaNDS is a series of spreadsheet programs using the net energy and metabolizable protein systems. Using Microsoft Excel, it assists producers in balancing rations for all types of beef cattle. BRaNDS helps optimize the utilization of on-farm resources, featuring 6 ration modules. See the brochure with module availability and pricing for Iowa and Kansas. What exactly does BRaNDS show you? View a report output sample . The BRaNDS Appendix contains many tools for estimating feed quantities and qualities along with some cattle and pasture growth and development. The Appendix is part of the Professional Edition, but can be purchased separately for use with other editions. The Beef Cow Module uses criteria like condition score, production stage, breed type, weather conditions, and feedstuff utilization to determine if nutritional demands of the herd are met. Included is a modifiable feed library, which replaces previous ISU cow program MCS 13. The Heifer Module in a calendarizedach that can go back to a baby calf and be utilized through the third trimester of the first pregnancy to do developing heifer rations. This pro or lifecycle approgram incorporates the target weight concept to assist the user in balancing rations that meet target daily weight gains. Batch mix and TMR are included. Ideally suited for bull test rations, the Growing and Breeding Bull Module takes into account factors influencing nutrient demand and feedstuff choices to determine if weight gain goals are met. This module is for breeding age bulls. Like the Beef Cow Module in concept, this program assists in optimizing the use of feedstuffs in maintaining the herd bull battery. 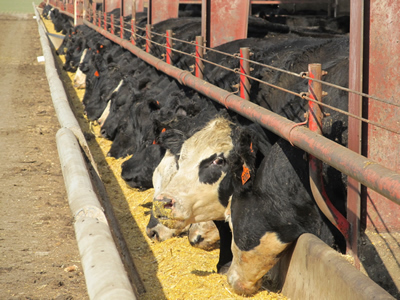 This module helps solve everyday feedlot ration problems. Besides normal cattle descriptions, frame size defined by weight at 50-percent choice, facility type, environment and feedstuff mixes are used to calculate whether daily gain goals are met. Implant type, Optaflexx, and MGA are included. Replaces previous ISU feedlot program MCS 7. Purchase all Standard Edition Modules (0100, 0200, 0300 and 0600) and pay one low price. This version was developed with the frequent ration developer and consultant in mind. Included are modules for breeding cows and heifers, growing and breeding age bulls, stocker cattle, and feedlot cattle, with numerous enhancements in each module. This edition allows you to evaluate rations for groups ranging in weight and production stages. Added features include: all modules are incorporated into one edition with a shared feed library; capability of multiple feed library storages; multiple client folders with multiple ration storages; added professional ration analysis printouts; least-cost formulation; custom mix module; feedout projections and total feeding period amounts using formulated rations. Use to evaluate and formulate rations for growing cattle on grass or crop residue. Utilize your own feed analysis or refer to the program’s default feed library. Recommendations primarily based on The National Academies for Science, Engineering and Medicine documents. NOTE: Standard Editions require Microsoft Excel on PC or Macintosh computers. The Professional Edition requires a PC running Microsoft Excel.